Obituary for Roseann Y. 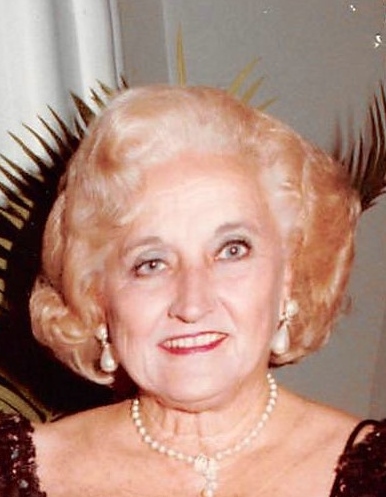 (Yarchak) Austin | McDonald-Aeberli Funeral Home, Inc.
Roseann Yarchak Austin, age 93, of Gibsonia, passed away on Monday morning, February 4, 2019 at Valencia Woods. She was born in Johnstown, PA on April 5, 1925, the daughter of the late John and Rose Yarchak. Roseann had been an executive secretary for Acme Markets in Johnstown. She was a member of the First Presbyterian Church of Bakerstown and after her husband’s death, she attended St. Kilian Church. Active in the community, she was a member of the Red Hatters, the Civic Light Opera, the Richland Civic Club, the North Suburban and Richland Fine Arts Leagues, the Pittsburgh Opera, Boys Club, Cystic Fibrosis Foundation, Gold Coast Guild of Ft. Lauderdale, the Butler and Treesdale Country Clubs and the Pittsburgh Athletic Association. A loyal friend known for her humor and caring nature, she was a generous and loving mother, grandmother, mother-in-law, sister and aunt. She was the dearly beloved wife of 45 years of the late Harry Austin, Jr., who she married on May 4, 1957 and who died on October 12, 2001. Also preceded in death by her sisters, Mary Tynan and Anne Yarchak and her brothers, Charles, Nicholas, Michael and Joseph. Surviving are her sons, Harry Austin, III, and his wife, Mary Ellen, of Wexford and J. Douglas Austin and his wife, Carmen of Gibsonia, her grandchildren, Harry Austin, IV, Brian Austin and his wife, Alex, and Colleen Austin and her fiancée, Dean Smalligan, and a sister, Rosemary Hornak of Tulsa, OK and a great grandson, due in July. Friends will be received at the McDonald-Aeberli Funeral Home, Inc., 238 Crowe Ave. Mars, PA on Friday from 2-4 & 7-9 PM. Mass of Christian Burial in St. Kilian Church, 7076 Franklin Rd. Cranberry Twp., PA 16066 on Saturday at 10:30 AM. Fr. Charles Bober, pastor, officiating. Entombment in the family mausoleum at Bakerstown Cemetery. In lieu of flowers, donations in Roseann’s name may be made to St. Kilian Church Building Fund or to St. Barnabas Charities, 5850 Meridian Rd. Gibsonia, PA 15044. Directions and condolences are available at www.mcdonald-aeberli.com.